What's For Lunch Honey? : EBBP # 2- Look what I got and what I am sending! EBBP # 2- Look what I got and what I am sending! This is what the postman brought for me on the weekend. More on the contents of this chocolatey package and a sneak peak at the package I sent off to a mystery person, a little later today. It was time for EBBP again, this time being hosted by my friend Johanna over at The Passionate Cook. I was glad I was able to take part in it, as just in the nick of time I was able to register myself before my vacation and Johanna accepted me posting my parcel after my vacation. On Saturday I received my surprise parcel from the very gracious and thoughtful Xoch of Xochitl Cooks. Xoch's blog is new to me and after browsing through it i believe I will become a regular! Xoch put together an amazing collection of chocolates from around the world. For a chocolate freak like me it was a fantasy come true!! I had to hold myself off from jumping into the box and living there for the weekend LOL! "I really like the floral taste even though it reminds me of old ladies." Xoch yes ... they really do, but are delicious. "Fortunately I saw that you are "mad about chocolate"! I therefore decided to send you a chocolate tasting pack." Xoch, thanks a million for putting this parcel together I love every bite! Then there is a mystery person who will be receiving the package I sent off yesterday. 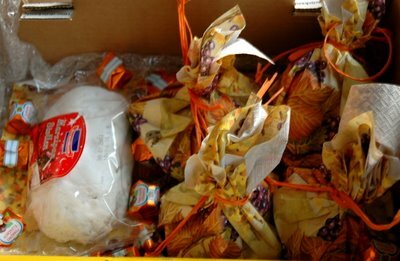 I decided to pack a few goodies that celebrate the upcoming seasons, one of which is a traditional German "Stollen". What could be in the rest of the little pouches? Your guess is as good as that of the recipient. Why don't you all have a go at guessing? Totally unrelated to this post - I was reading your London visit posts. Sorry about the camera.. though you have a nice one now! To the point - you had mentioned that you had bought different colored back drops for taking pictures and checked out some interesting books.. so I wanted to ask you where you got the boards from and about any intersting shops I could check out here (London). Blogging by Post is so much fun! I can't wait to participate in my next one! I'm really sorry I missed this round of EBBP. 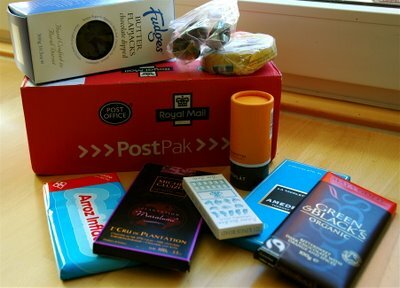 The package you got from Xoch looks incredible, I'm really craving lots of yummy chocolate at the moment!! You're recipient will LOVE stollen I'm sure, who on Earth could resist such a tasty treat! old ladies? good lord. but i trust that xochi sent you good stuff, she sure is one girl who knows her chocolate... thanks for participating this time! what a great event! and the mystery person receiving your package is just as lucky! How great a package is that! Thanks for taking part - next round will be in the dark depths of Jan/Feb so hope you can take part agian. Thanks for the EBBP parcel! It arrived this morning and I had to wrestle it from my office mates arms as they were all very excited to see chocolate on the label. It has made my day and I look forward to taking it home to nibble at with a wooly jumper and a big mug of tea!!!! !